GruupMeet’s meeting logistics tool keeps program managers, transportation companies and hotels connected to effectively coordinate, manage and execute all of their events in one place. Planning teams work more efficiently to access real-time information about their events, handle changes and oversee event-related communications seamlessly so there’s no conflict or confusion. GruupMeet continuously organizes accurate event updates across multiple meetings and device types. There's no need for training beforehand to start sharing live event information with collaborators. Participants do not need to download or install anything to benefit. Simplified processes and collaboration provides better transparency, which produces more productivity and happier attendees. We have experienced LOTS of challenges and struggles with other event management software solutions. Existing tools often take serious attention to follow and keep up with, and usually focus on features and problems teams don’t have on a reoccurring basis. This keeps teams busy but doesn't help ensure smooth adoption or enhanced productivity levels that often greatly impact critical business objectives and meeting experiences.No download or install required so guests don’t have to worry about keeping up with anything! Also provides planning teams with text message alerts to keep everyone informed with fast-changing and continuous updates in an effective manner. No download or install required so guests don’t have to worry about keeping up with anything! Also provides planning teams with text message alerts to keep everyone informed with fast-changing and continuous updates in an effective manner. My group calls to my young mentees are conducted on this software and we like it very much on our smartphones as we don't have to be glued to our desktop phones at work to conduct business with multiple people at different companies, Industries, and in different walks of life. Sometimes it's tough to connect as the connectivity goes in and out. It's a cheaper option so that makes sense as to why there's some issue with that. We used all sorts of file sharing, spreadsheet, calendar, etc. tools before this. They understand high-stakes group business, and the platform is extremely well designed. Great for agencies to manage transportation logistics, pickup times and see live manifests! Might take a small amount of time to become familiar with the product, however, the software is very user-friendly, collaborative and effective in managing group logistics. GruupMeet is exactly what I was looking for my business. The ability to use GruupMeet succinctly across multiple platforms sets it apart from the competition. Additional plans and services available. GruupMeet enables meeting professionals to communicate a single message to hundreds of participants at the click of a button. Users can get live flight status updates, baggage claim info and on-site history in real time, via any connected device. GruupMeet allows users to share information, files, events and chat or text replies from participants within collaborating teams. Participants do not have to download or install any software to be able to access and use the GruupMeet platform. Messages are personalized for each participant, and can be either automated based on specific actions, or sent manually for on-demand notifications. Below are some frequently asked questions for GruupMeet. Q. What type of pricing plans does GruupMeet offer? Q. 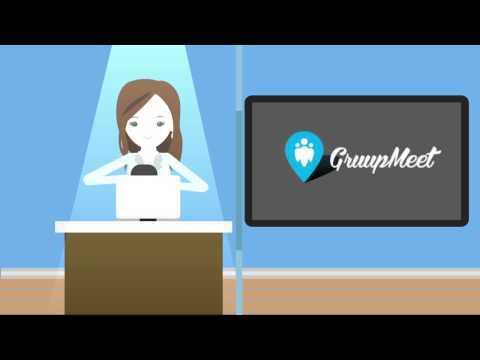 Who are the typical users of GruupMeet? Q. What languages does GruupMeet support? Q. Does GruupMeet support mobile devices? Q. Does GruupMeet offer an API? No, GruupMeet does not have an API available. Q. What other apps does GruupMeet integrate with? Q. What level of support does GruupMeet offer? Q. Which apps is GruupMeet compared to most often?